Today was an easy 11.9 mile hike to Bland, VA. 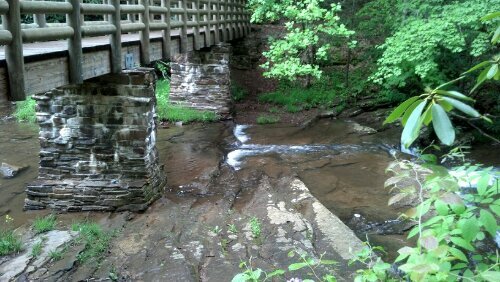 The only thing really interesting was a nice bridge over cascades with a good swimming hole but it was a little chilly and we were trying to get to town so we did not go in. Stretch and I got to the road and it did not look like easy hitching but a nice older couple who is traveling through the area picked us up within ten minutes. We drove right by Bass who had not gotten a hitch and had walked almost the whole way to town. They dropped us off at Dairy Queen and went back to get him but missed him somehow. The DQ was a little far out so we got another hitch back into town to go to the library but it took almost ten minutes again. It doesn’t seem to be a very hiker friendly town. Usually people know you’re hiking and not hitchhiking and pick you up quickly but that did not seem to be the case here. After the library we decided to stay in town because Bass’ aunt offered to pay for a room and the weather radar looked bad. We had only planned on going two more miles out of town to a shelter any way so that will be easily made up in the morning.